This colourful summer salad makes a low-fat, but filling, lunch or supper dish and takes only 10 minutes to prepare from start to finish. Place the couscous in a bowl, add the stock and leave for 5 minutes until the water has been absorbed. Fluff up the couscous with a fork and allow to cool completely. Roughly chop the peppers. Halve the avocado, remove the stone and peel, then chop the flesh roughly. Trim and finely chop the salad onions. Peel and halve the cucumber lengthways, remove the seeds using a teaspoon, then slice into chunky pieces. Halve the tomatoes. 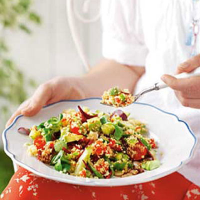 When ready to serve, place the cooled couscous, peppers, avocado, onion, cucumber, tomato and salad leaves in a serving bowl. Whisk the lemon juice and vinegar together with a little seasoning and drizzle over the salad. Toss well and serve, either as a meal in itself, or with hand-carved turkey or ham slices from the deli counter, plus warm crusty bread. Try using vegetables such as roasted courgettes, red onions and aubergines, or use millet or bulghur wheat instead of couscous.